I ordered the translucent orange dice but upon opening them they were a strange orange/pink color similar to watermelon hard candy. I actually really like this unique color and prefer it over the orange. The dice had no flaws such as air bubbles, paint runs in the numbers or casting fractures common in lower cost Chinese made dice. I am really pleased with the quality and color of these dice. Be prepared to wait 30-35 days for these to be delivered, but they are worth the wait. Given that an individual set of dice cost 11.00$ CAD, having 7 sets for the same price was a no-brainer. The fact that they came with individual carry pouches was icing on the cake. 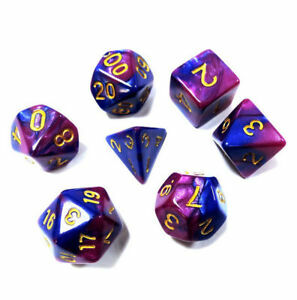 For any of you out there that play games that require this sort of dice, I recommend these to you. Perfect dice, one of each main dice needed, plus comes with a little storage bag thst is a nice little bonus. I highly recommend. You can not beat the price. Great dice at an awesome price. Great way to get extra sets for my new players.